Until now GAC was largely unknown. But it's causing a stir at the Detroit Auto Show. 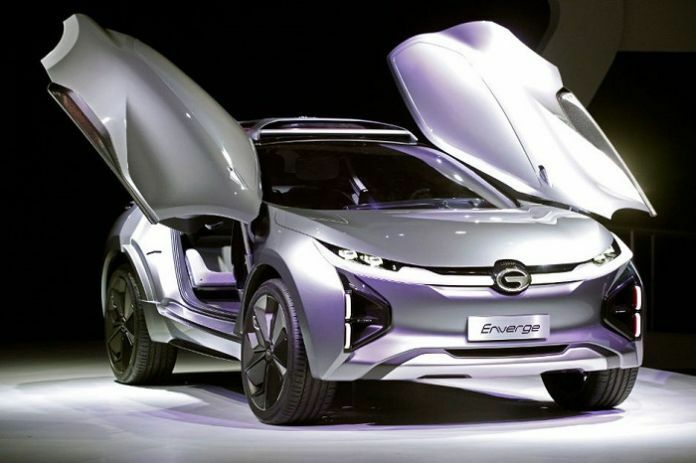 Founded in 2008, the company presents its concept car Enverge in Detroit. This is an electrically powered SUV. The futuristic design of this car shows clear edges and slot-shaped front LED headlights under which you can see the far down windscreen. The dashboard dominates inside the interior. The steering wheel is U shaped, like in airplanes. As The Verge writes, Enverge is said to have a range of nearly 370 miles on a single charge, a 71-kilowatt battery and a wireless charging technology, which in 10 minutes stores enough energy to drive 270 miles. Enverge's 370 miles per single change gives the it the potential to become a Tesla challenger. Tesla's Model 3 has 310 miles of range per single charge. The industry should not underestimate this Chinese competitor. Chinese cars these days are well connected. On the company website Denso, Continental, Bosch, Magna and Siemens are mentioned as supplying partners. GAC cooperates with Honda, Toyota and Fiat Chrysler. Furthermore, the company points out that it has tested its vehicles in Germany and Austria under different road and weather conditions. GAC has also shown that the company's announcements follow action. Founded in 2008, the automaker serves two product lines: an SUV with five models and four sedans from compact to mid-size. They are manufactured by 13,000 employees in a factory covering an area of ​​1.2 million square meters. Their capacity is called 350,000 vehicles per year. This is a serious company. The registered capital of the company is stated to be 4.2 billion yuan (614 million US dollars). For comparison: Daimler's capital is 6 times bigger (about 3 billion euros). GAC is considered the fifth- to six-largest automaker in China. This automaker also sees itself as a global company. In 2017 it has exported the 10 percent of its cars. For the 2020 CAG aims for 20 percent with a production volume of one million vehicles sold. Most cars, made by GAC are conventional ICE cars. However, the company already has two hybrids and one pure EV SUV (GE3) on sale. It has 192 miles of range per single charge. There is no information about the market launch and the price of the car presented as concept car at the 2018 Detroit Auto Show. It is expected that GAC will start selling Enverge in the United States in 2019. Apparently there are ongoing discussions between GAC and Fiat-Chrysler using the latter's dealership network. Tesla better hurry up with its Model 3 deliveries. Chinese EV manufacturers with solid record may soon overtake Tesla's US market share unless Tesla speeds up its Model 3 deliveries. Let us know what you think about this development in the comments section below. Yet another "Tesla challenger". Why can't they just emerge as EV makers which are ICE challengers. The market for SUVs is large enough to absorb five more such companies without any existing company being "challenged" I've own my Tesla for 4.5 years and every year I heard of another "Tesla killer." None have actually emerged of a time long enough to completely develop a car. Let's see it on the street. Let's see a comparable charging infrastructure. Let's see it perform through ICE dealerships (who, by the way, hate selling EVs) and then let's see who survives before we talk about "challengers." It's the 10 min recharge that makes me doubt it. Transfer of power always ends up with waste heat. And they are pumping about 68kw In 10 mins, I think that's enough to melt parts. Tesla should feel very proud that every fake/prototype/non-existent EV headline starts with their name. Only makes me want a Tesla more. If anyone has been watching the NFL playoffs, playing from behind = desperation. Good luck catching up. GAC's Enverge is not a “Tesla killer” without a robust L3 charging network integrated into the navigation system of the vehicle. I dare you to drive a Bolt cross country using existing charging locations in anything close to the 50 hour record that a Tesla Model 3 recently set. I will start thinking the Chinese EV's matter when they start installing or funding domestic charging stations en mass. One major problems with other car manufacturers is that they often find it very difficult to satisfy the NHTSA safety requirements for their cars. Most decided that it isn't worth their investments and efforts after all, when other countries are easier to penetrate, such as the European market which has less stringent safety rules.